Internal impingement is commonly described as a condition characterized by excessive or repetitive contact between the posterior aspect of the greater tuberosity of the humeral head and the posterior-superior aspect of the glenoid border when the arm is placed in extreme ranges of abduction and external rotation.This ultimately leads to impingement of the rotator cuff tendons (supraspinatus/infraspinatus) and the glenoid labrum. There are two types of internal impingement: anterosuperior and posterosuperior. Anterosuperior impingement occurs only rarely. The scapula is a flat blade lying along the thoracic wall. Because of the wide and thin configuration, it’s possible for the scapula to glide smoothly on the thoracic wall and provides a large surface area for muscle attachments, both distally and proximally. The coracoacromial arch and the subacromial elements are important elements of anatomy related to internal impingement. As the name implies, the coracoacromial arch is formed by the coracoid and the acromion processes and the connecting coracoacromial ligaments. It protects the humeral head and subacromial structures from direct trauma and superior dislocation of the humeral head. Impingement may occur when the rotator cuff and other subacromial structures become encroached between the greater tuberosity and the coracoacromial arch. The rotatorcuff stabililizes the shoulder against the action of the prime movers to prevent excessive anterior, posterior, superior, or inferior humeral head translation. The rotator cuff tear is located on the articular side of the rotator cuff, typically at the intersection of the infraspinatus and supraspinatus insertions onto the humeral head. The scapulothoracic articulation is a prime example of dynamic stability of the human body. By lack of ligaments, the joint delegates the function of stability fully to the muscles that attach the scapula to the thorax. So their proper function is essential to the normal biomechanics of the shoulder. The serratus anterior and the trapezius has been suggested to be the most important muscles acting upon the scapulothoracic articulation. The incidence of internal impingement is unknown due to the variety of associated pathologic lesions and diagnostic difficulty.The majority of patients who have been identified as having internal impingement are overhead athletes or throwing athletes (tennis, volleyball players, and swimmers ). These patients participate in activities requiring repetitive external rotation and (hyper) abduction.The majority of the research on internal impingement has been done on elite baseball players. However, non-elite athletes, as well as non-athletes may also be affected by internal impingement. With the non-elite athletic population, it is important to realize that older patients are more likely to have concurrent shoulder conditions. Since internal impingement is often involved with other pathology of the shoulder the incidence of it in isolation has not been established. The understanding of the etiology behind internal impingement has gradually evolved but remains incomplete. The lack of a common biomechanical model is largely due to the limited patient population in which the syndrome is seen in as well as the thousands of associated pathologic findings that have been reported. Impingement has been described as a group of symptoms rather than a specific diagnosis.In this current opinion, it is thought that numerous underlying pathologies may cause impingement symptoms. Glenohumeral instability, rotator cuff or biceps pathology, scapular dyskinesis , SLAP lesions and glenohumeral internal rotation deficit have been associated with impingement symptoms in the clinical literature. scapular dyskinesis, decreasing the quality of functional scapular stability. Anterior GH instability: Jobe et al. hypothesized that anterior instability/laxity of the shoulder complex caused by repetitive stretching of the anterior GH capsule led to this type of impingement in throwing athletes. This laxity allows for increased anterior humeral head translation.This type of acquired instability is often referred to as acquired instability overuse syndrome (AIOS). 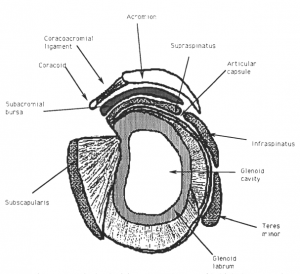 Tight posterior GH capsule: The posterior-inferior GH joint capsule is hypothesized to become hypertrophied in the follow-through tensile motion of throwing.The tightness of the posterior capsule and the muscle tendon unit of the posterior rotator cuff is believed to limit internal joint rotation. Posterior capsule tightness leads to GIRD (glenohumeral internal rotation deficit). Burkhart et al. defined GIRD as a loss of internal rotation of >20° compared with the contralateral side. When the posterior structures of the glenohumeral joint are shortened, this may compromise the hammock function of the inferior glenohumeral ligament (IGHL), and increase the risk for impingement symptoms during throwing. Muscle imbalance and/or improper neuromuscular control of the shoulder complex: Jobe et al. 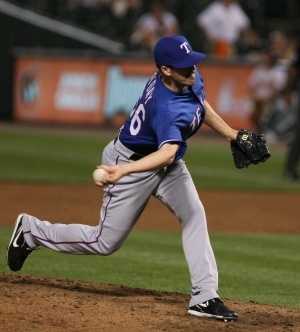 also reported that malpositioning of the arm relative to the glenoid bone during throwing motions can also lead to impingement of the rotator cuff tendons between the glenolabral complex and the humeral head. Fatigue and/or weakness of the scapular retractors have been shown to cause a decreased force production in all four of the rotator cuff muscles, which would also lead to abnormal positioning of the GH joint. At the base of this abnormal scapular positioning lies the lack of neuromuscular control of the periscapular musculature as well as muscle imbalances between the rotator cuff and upward rotators of the scapula (serratus anterior, upper trap, lower trap). Chronic - diffuse posterior shoulder girdle pain is the chief complaint in the throwing athletes with internal impingement, but the pain may also be localised to the joint line. The patient may describe the onset of posterior shoulder pain, particularly during the late-cocking phase of throwing, when the arm is in 90° of abduction and full external rotation. Decrease in throwing velocity - a progressive decrease in throwing velocity or loss of control and performance in the overhead athlete. Muscular Asymmetry - Overhead athletes and throwers in particular often have muscular asymmetry between the dominant and the non-dominant shoulder. Anterior Instability - Patients may have instability symptoms, such as apprehension or the sensation of subluxation with the arm in a position of abduction and external rotation. Jobe developed a classification scheme to further distinguish between the varying severities of internal impingement. The Jobe classification system focuses on the primary patient population of overhead athletes. Stage I (early) : Shoulder stiffness and a prolonged warm-up period; discomfort in throwers occur in the late-cocking and early acceleration phases of throwing; no pain is reported with activities of daily living. Stage II (intermediate) : Pain localised to the posterior shoulder in the late-cocking and early acceleration phases of throwing; pain with activities of daily living and instability are unusual. Stage III (advanced) : Similar to those in stage II in patients who have not responded to non-operative treatments. Each of these disorders can exist alone or as a concomitant pathological condition. In many situations, the diagnosis of internal impingement is made through the physical examination along with MRI and radiographs. Magnetic resonance imaging has been used frequently to diagnose pathologic conditions of the shoulder. Its sensitivity and specificity for the detection of labral tears and rotator cuff disease are on the order of ‡95%. Magnetic resonance imaging has the advantage of being able to detect intra-substance tears that may be difficult to visualize with arthroscopy. The findings of magnetic resonance imaging of patients with internal impingement are usually more subtle. Findings on magnetic resonance imaging of patients with internal impingement include mature periosteal bone formation at the scapular attachment of the posterior aspect of the capsule (The Bennet lesion) and moderate to severe posterior capsular contracture at the level of the posterior band of the inferior glenohumeral ligament. Shoulder Disability Questionnaire (SDQ): The SDQ is a measure covering 16 items designed to evaluate functional status limitation in patients with shoulder disorders. This questionnaire is a valid and reliable instrument. Shoulder Pain and Disability Index (SPADI): The SPADI developed by Roach et al., consists of a separate 5-item pain scale and an 8-item disability scale, with the preceding week as the recall frame.The questionnaire was found to have good internal consistency, test re-test reliability, and criteria and construct validity in a sample of 37 male outpatients with shoulder complaints. Shoulder Rating Questionnaire (SRQ): Shoulder Rating Questionnaire by l'Insalata et al. consists of 19 items with a 5-point ordinal answer scale: 4 relate to pain, 6 to daily activities, 3 to recreational and athletic activities, 5 to work, and 1 to satisfaction. The Shoulder Rating Questionnaire also includes a visual analogue scale for global assessment, as well as an item to indicate the domain of most important improvement. When evaluating a patient with suspected internal impingement syndrome, it is very important to get a thorough history, as it is an important element of the clinical diagnosis. However, diagnosing internal impingement on the history alone is extremely difficult as symptoms tend to be variable and non-consistent. A thorough, complete examination of the shoulder complex must be done to rule in/out any concomitant shoulder pathologies. SICK Scapula: Burkhart et al. have reported that scapular protraction is also a common finding in these patients. This is characterized by Scapular malposition, a prominent Inferior medial border, Coracoid pain, and scapular dysKinesia, all of which can be picked up in the basic examination during palpation and observation of the scapula. Tyler et al. reported that scapular retractor muscle fatigue led to an overall decrease in force production of the rotator cuff muscles as well as the decreased strength of the scapular stabilizers. Recently, a small number of tests were created to help rule in/out the presence of internal impingement. Posterior Impingement Sign: Meister et al. investigated the ability to detect articular-sided rotator cuff tears and posterior labral lesions. They reported a sensitivity and specificity of 75.5% and 85% respectively, meaning a negative test is extremely accurate in ruling out posterior rotator cuff tears. A (+) test is indicated by the presence of deep posterior shoulder pain when the arm is brought into a position of abduction to 90° to 110°, extension to 10° to 15°, and maximal external rotation. Relocation Test: Jobe and colleagues have reported this can be used to identify internal impingement. A positive test would be posterior shoulder pain that was relieved by a posterior directed force on the proximal humerus. But, there is insufficient evidence upon which to base selection of physical tests for shoulder impingement, and local lesions of bursa, tendon or labrum that may accompany impingement, in primary care. The large body of literature revealed extreme diversity in the performance and interpretation of tests, which hinders synthesis of the evidence and/or clinical applicability. Tests for other shoulder pathologies may be (+) or (-) due to the variable clinical presentation of internal impingement. Understand that there is no proven combination of test findings that identify internal impingement. Conservative management of internal impingement is an appropriate initial approach, particularly in patients who do not report an acute traumatic event.We can divide the medical management in non-surgical treatment and surgical treatment. All these interventions will be used in addition to a structured, supervised physical therapy regimen. Surgery for internal impingement may be indicated if improvements have not been seen with a prolonged rehab protocol specifically designed to correct any impairments, imbalances, deficiencies and/or pathologic findings. Arthroscopic interventions -It is the preferred type of surgery. Prior to any surgical procedure, it is highly recommended that a thorough exam under anesthesia (EUA) is done, as well as a diagnostic arthroscopy. Due to the often-confusing physical findings that may be associated with internal impingement, the final therapeutic surgical plan should be aimed at specific pathologic lesions related to patient symptoms that have been identified from an EUA and diagnostic arthroscopy. It’s recommended that the EUA specifically assess for GH ROM, any kind of subluxation, as well as a meticulous analysis for the presence of any instability. If an overhead athlete report feelings of tightness, stiffness, or not loosening up, the pitcher should be removed from participation and started in a rehab program. It is important, before treatment is undertaken, to rule out other anterior instability pathology, including SLAP lesions, labral tears, and partial rotator cuff tears. Closed kinetic chain exercises for stabilizing the rotator cuff muscles. Strengthening periscapular musculature and the rotator cuff muscles to prevent over-angulation in the late cocking phase of throwing. With early internal impingement, the thrower (the incidence of glenoid impingement in throwers, especially pitchers, is high) or involved patient reports the shoulder is stiff and not loosening up as it normally would. Three stages of internal impingement have been described (Table ). In 2008, Cools, et al. published guidelines for rehabbing internal impingement in tennis players based on clinical literature and clinical experience. Parts of these guidelines are backed by evidence, but many of the treatments discussed have not been validated with medical research, so until that research is conducted these guidelines may provide a foundational starting point for clinicians treating internal impingement. Realize that this protocol is geared toward the athletic population. However, it can be applied to the non-athletic population as well by incorporating activity-specific functional activities instead of sport-specific. A non-athlete may also not need to progress all the way to phase 3, which will depend on the activity level they wish to return to. • Closed chain exercises: are suggested because axial compression exercises that put stress through the joint in a weight-bearing position result in joint approximation and improved co-contraction of the rotator cuff muscles. Improve dynamic stability-restoration muscle balance: more complex and activity specific exercises. With muscle imbalances already addressed, the therapist can begin to add dynamic movements into rehab using “tactile cueing” to ensure the patient is engaging the scapular musculature before beginning a movement. Progress to verbal cueing. Strengthening exercises: Target all shoulder and scapular musculature. Start introducing eccentric and open kinetic chain exercises in order to begin preparing for specific athletic overhead movements. Functional rehabilitation plan: Designed to prepare the athlete to return to full athletic activity. Strengthening exercises are continued and plyometrics are initiated using both hands and limiting external rotation at first, progressing to one-handed drills and gradually working into increasing velocity and resistance. Rehabbing the GIRD component: Started immediately upon 1st treatment and continue throughout. Stretching techniques that focus on increasing posterior shoulder soft tissue flexibility are commonly incorporated into prevention and treatment programs for the overhead athlete. The cross-body and sleeper stretch exercises have been described as stretching techniques to improve posterior shoulder soft tissue flexibility and to increase glenohumeral joint internal rotation and horizontal adduction range of motion in the overhead athlete.The sleeper stretch is performed with the patient lying on their injured side with the shoulder in 90° forward flexion, the scapula manually fixed into retraction, while glenohumeral internal rotation is performed passively. The patient should feel a stretch in the posterior aspect of the shoulder and not in the anterior portion, if they do, then reducing the intensity and rotating the trunk slightly backward can reduce the intensity of the stretch. Joint mobilizations (mobs): GH anterior-posterior joint mobs can be used to help stretch the posterior capsule and increase internal rotation, however, if instability is noted on the initial exam, joint mobs should be avoided. Grade IV, end range, dorsal-glide mobilizations are performed with the patient supine with shoulder placed into 90 abduction, and either in neutral or end range internal rotation of the humerus (refer to pictures). Whole body kinetic chain exercises: Incorporating this early in rehab has been recommended in order to prepare the athlete's whole body for return to activity. Core stability, leg balance, and diagonal movement patterns can be used to incorporate the entire kinetic chain while simultaneously involving the shoulder as well. One example of this is simply adding a degree of instability to an exercise; doing external rotation exercises while sitting on an exercise ball or while performing a single leg stance by standing on the opposite leg of the arm you are working. Rehabilitation for internal impingement should consist of several critical interventions including reversing GIRD in those with posterior shoulder tightness, creating improved dynamic stabilization of the glenohumeral joint through use of specific exercise techniques in those with hypermobility due to acquired instability, and developing neuromuscular control in those with scapular dyskinesis. Exercises should emphasize both scapular and rotator cuff muscle recruitment patterns in order to improve strength, endurance, and motor control.Special attention should be paid to correction of GIRD through the “sleeper stretch” which allows posterior capsular stretching. In a study of high-level tennis players performing daily “sleeper stretch” exercises, patients were found to have significant increases in both internal rotation and total rotation, as well as a 38% decrease in the prevalence of shoulder problems. ↑ 24.0 24.1 24.2 Paul A, et al. A comparison of four shoulder-specific questionnaires in primary care. Ann Rheum Dis 2004;63:1293-1299. ↑ Kirchhoff C, Imhoff AB. Posterosuperior and anterosuperior impingement of the shoulder in overhead athletes—evolving concepts. International orthopaedics. 2010 Oct 1;34(7):1049-58. ↑ Corpus KT, Camp CL, Dines DM, Altchek DW, Dines JS. Evaluation and treatment of internal impingement of the shoulder in overhead athletes. World journal of orthopedics. 2016 Dec 18;7(12):776.